This weekend features the Arena Skirmish bonus event, which is live July 10-13. The event quest from Seer Kazal in your garrison rewards 500 Conquest points, on top of the weekly cap, and completing skirmish matches will grant bonus honor during the event. Skirmishes may seem new, but they were originally introduced in The Burning Crusade alongside arenas. Unfortunately they were not used much and ended up being replaced by War Games in Cataclysm. 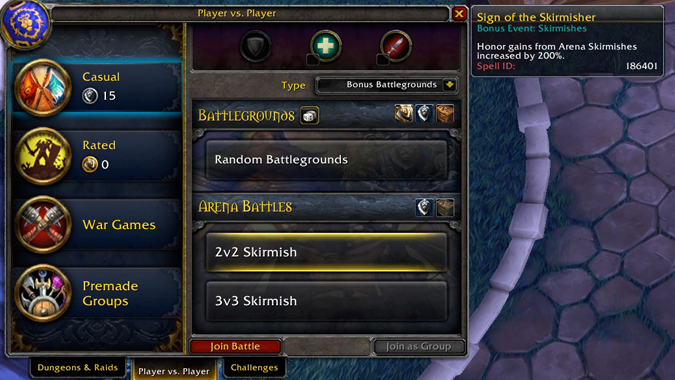 A lack of casual play for arenas and an increase in solo-queuing activities such as battlegrounds led to their re-introduction in Warlords of Draenor. Skirmishes are a practice mode for rated arenas. Since rating is not affected by the outcome of the match, it’s a good way for players to practice different team compositions or talents. Similar to the dungeon finder, skirmishes allow players to queue up for casual play, either solo or in a group with friends. There is a hidden matchmaking rating in effect in order to match groups a little better and keep skill levels balanced. Skirmishes are available in two sizes: 2v2 and 3v3. The system attempts to take roles into consideration and make sure that players are matched well, such as pairing a DPS with a Healer. Low-level characters are sorted into their own level-appropriate brackets (every 10 levels) starting at level 15, and characters with experience turned off are matched together in a separate queue the same way as battlegrounds. Winning skirmishes will award honor, which is tripled during the event this weekend, and a bonus. For low-level characters, that bonus is in the form of extra XP and is a nice leveling alternative. Level 100 characters get a Strongbox instead, which can contain gold, additional honor, or possibly a piece of PVP gear. Queuing up for skirmishes is very easy. Simply press “i” or open up the Group Finder interface, select the Player vs. Player option from the tabs at the bottom, scroll down to “Arena Battles,” and choose your desired mode (2v2 or 3v3). Finally, click “Join Battle” to enter the queue and find your new teammates.